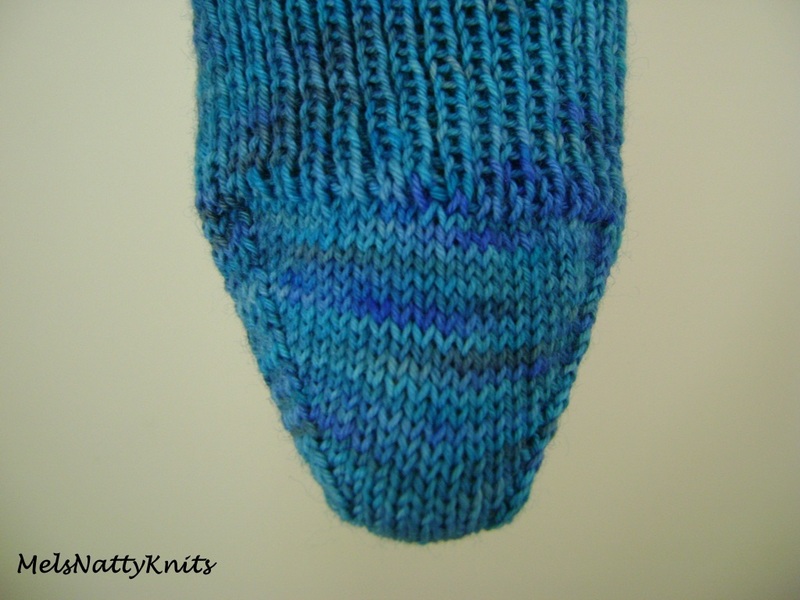 On one of my numerous visits to Ravelry I visited the Free Pattern Testers Forum and noticed a test knit was open for a pair of socks. 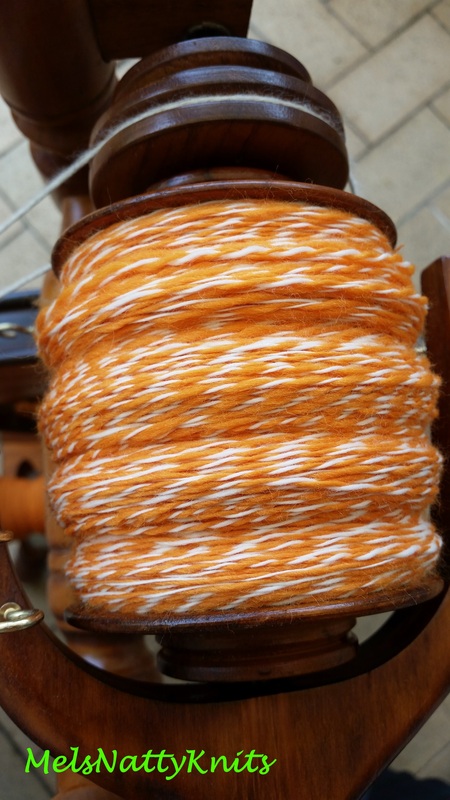 On an impulse I put my name down as a prospective test knitter and within minutes was sent the pattern. Yikes that was quick!! 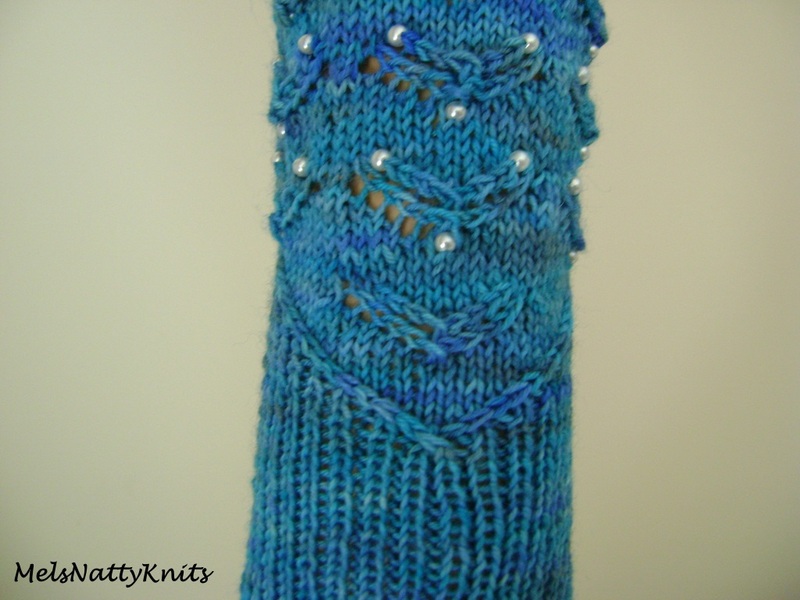 What drew me to this pattern was the fact that beads were knitted into the leg section of the sock which I rather liked. Not having used beads in socks I was quite keen to start. This is how the Promovendus socks looked after a few rows of the leg section. 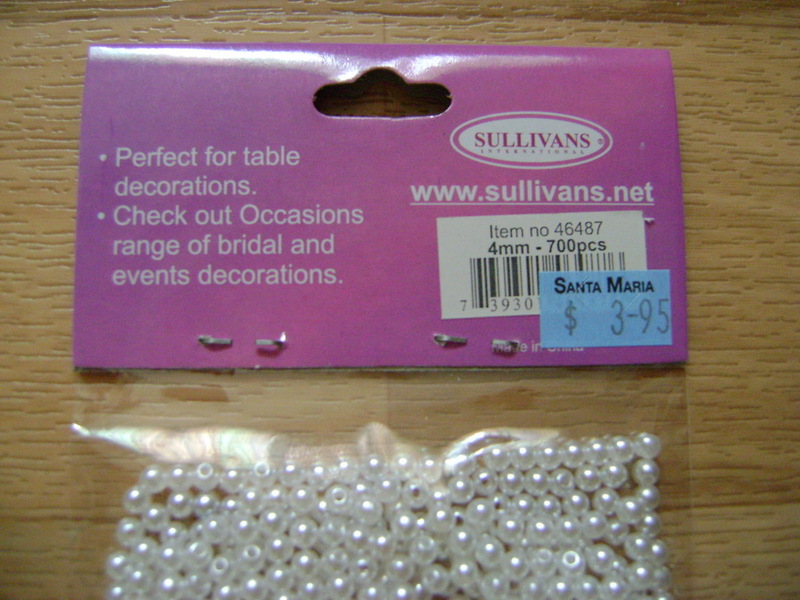 I was pretty excited as the beads looked fantastic and they were only ones I bought at my local cheap shop. They were very smooth with no rough areas on them at all. Cost me $3.95 for a bag like this. 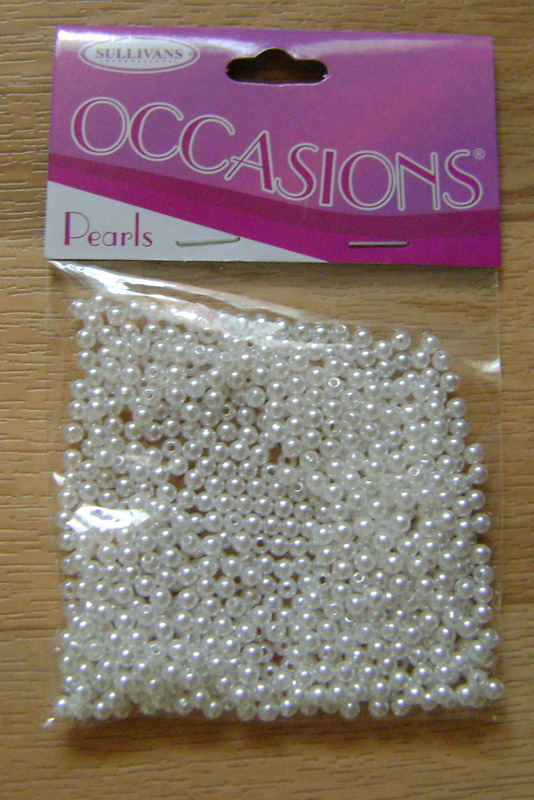 I subsequently went back to the shop and bought all their stock as these pearl beads will match just about any yarn! These socks unfolded beautifully as I really got into the pattern. And before I knew it I’d finished one sock! The second sock didn’t take as long as I was a bit more familiar with the pattern. The foot section is done in a K1, P1 ribbing which makes for a nice snug fit. 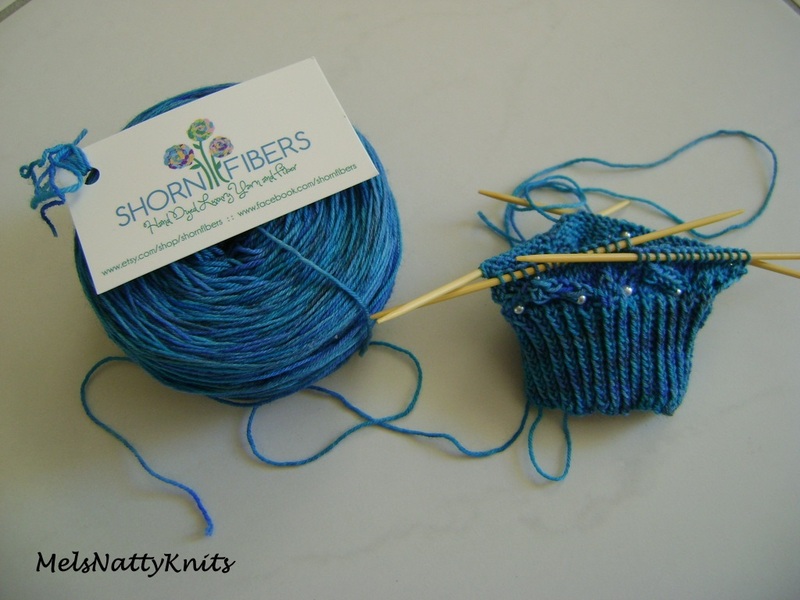 The yarn I used is Shorn Fibers Premium Sock in this gorgeous colourway called Rock Pool. The pattern is very well written and there were only a couple of errors that were spotted. I’m going to make another pair of these socks as I think they’re lovely!! 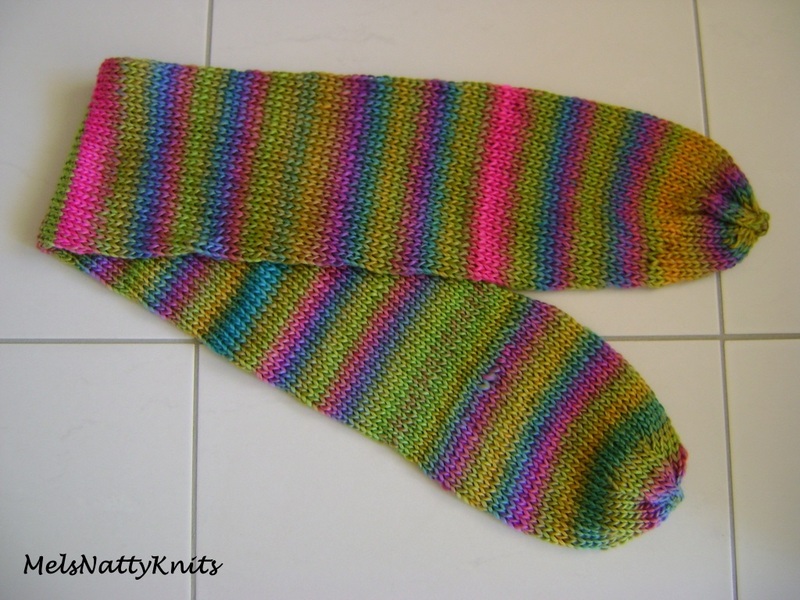 If you’re into knitting socks and want a challenge a bit more than plain vanilla socks then this pattern is for you. I highly recommend it and I look forward to more sock patterns from this very talented designer. The Easiest Scarf Pattern Ever!! I’ve made a few scarves over the last few years and I love it when I find really easy patterns as I tend to make quite a few from the pattern (remember the Minnie and the Croc-a-tail?). Well I have now found a really simple knit and what is even better is that the scarf is actually symmetrical. It’s called the Melissa Scarf and I’ve made six already!! 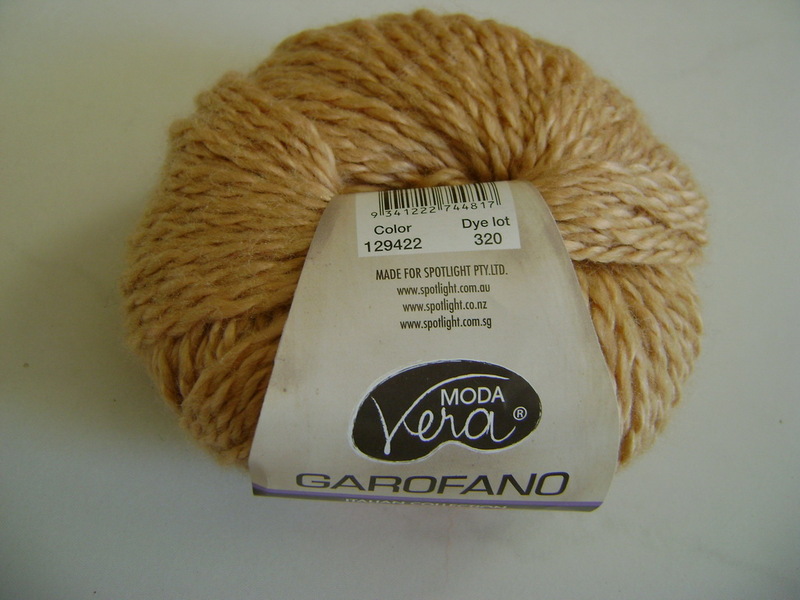 The first two scarves are both made using two balls each of Moda Vera Garofano which is a 50% acrylic / 40% wool / 10% silk yarn and so very soft. 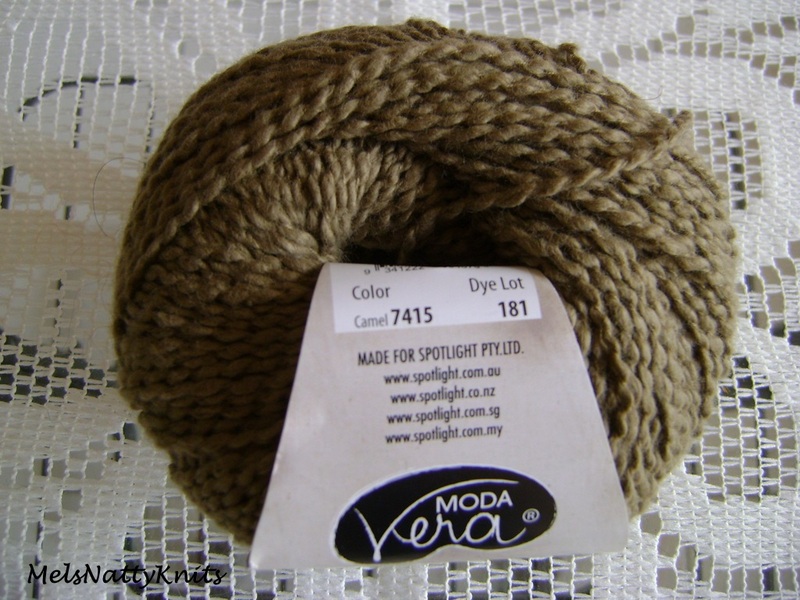 The next two scarves were made using two balls each of Moda Vera Roloutte which is a 100% cotton. 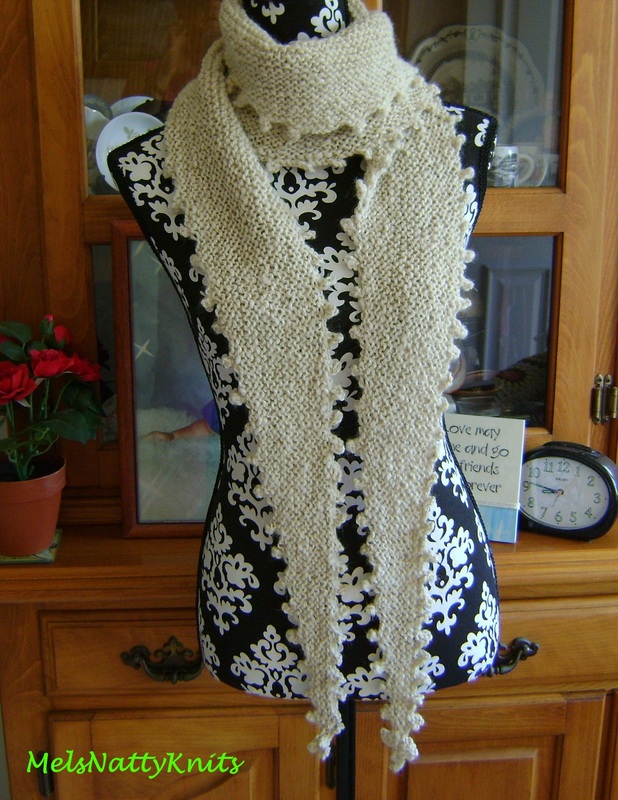 This Melissa Scarf was made using two balls of Passioknit Outback Langley which is a 50% wool / 50% acrylic yarn. Love these interesting shades of blue and red. 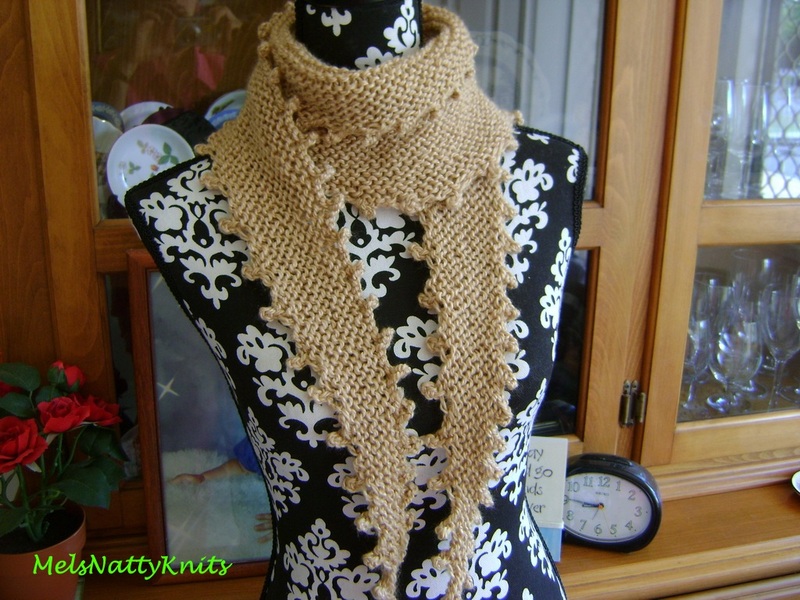 And lastly, this is the one I am most proud of as it’s knitted in my own handspun alpaca. 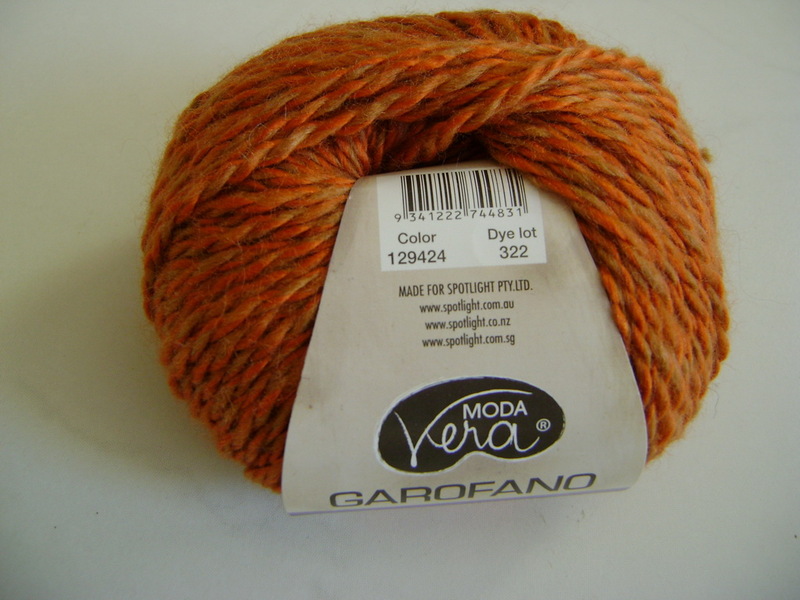 A while ago one of my spinning group members gave me a bag of this very dirty alpaca that had quite a bit of vegetable matter (VM) in it. 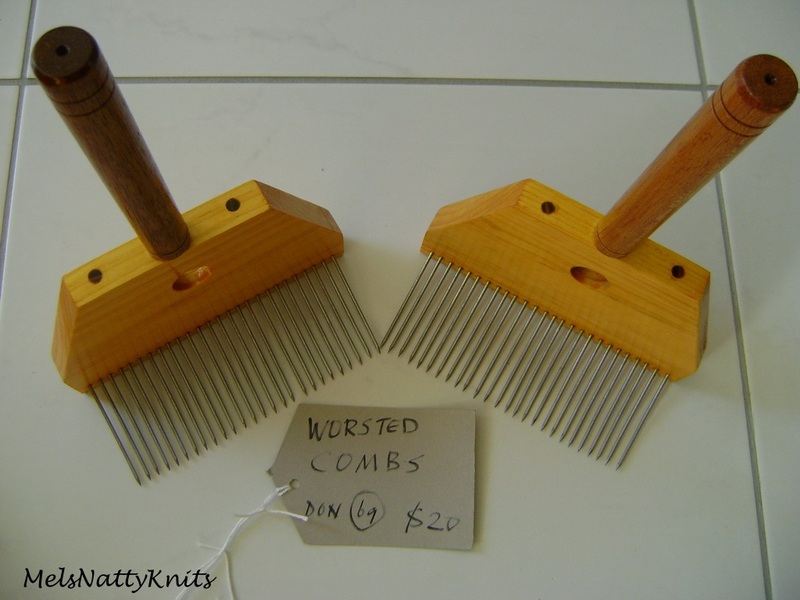 I wanted to experiment with combing wool so I managed to pick up these wool combs recently. They weren’t the best combs to use as the tines were too far apart and a lot of the alpaca and VM just slipped through. But I persevered as it was a great learning exercise. 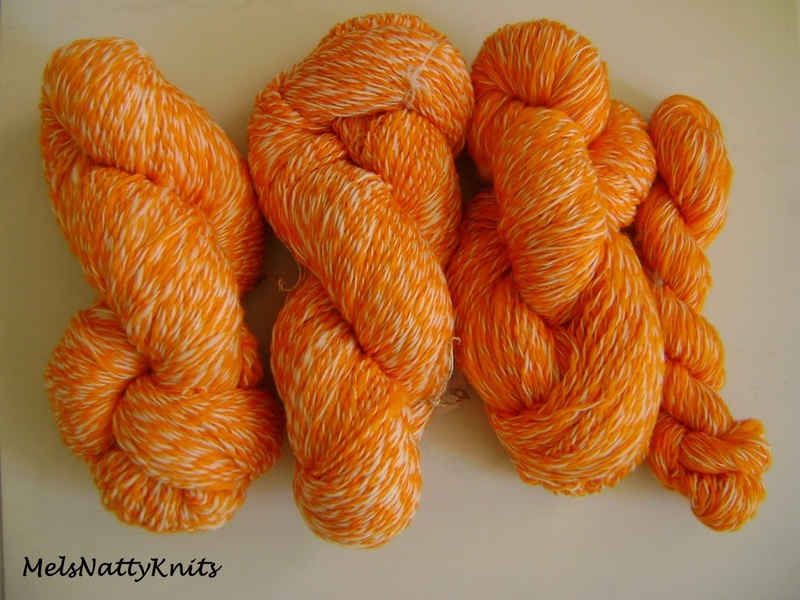 From all that dirty alpaca I managed to make these three skeins. 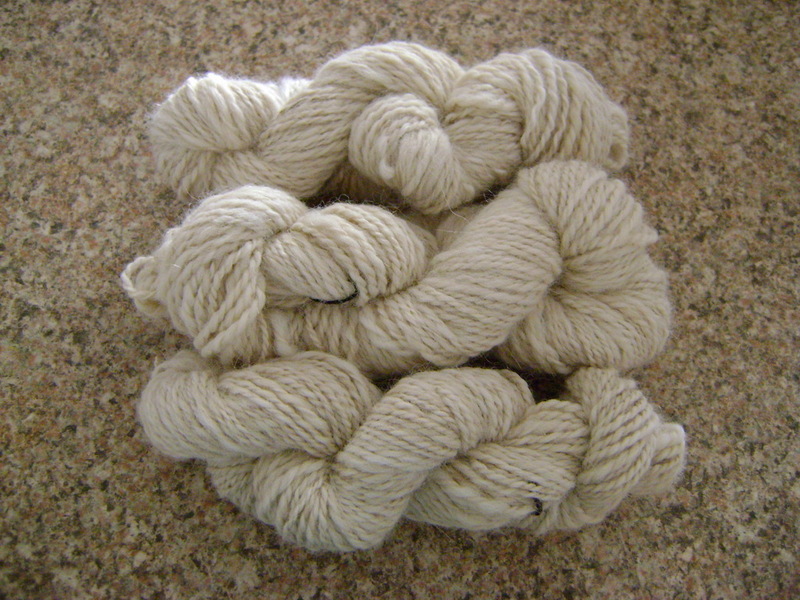 My very first handspun effort. I am so pleased with the outcome! 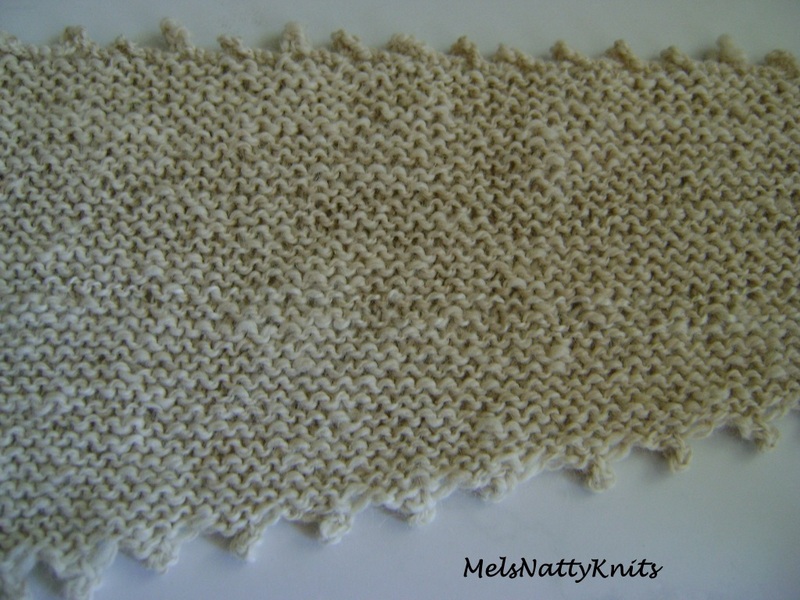 The main reason why this scarf is so easy to make is because it’s all done in garter stitch. Except for the first and the BO row, every row is the same. 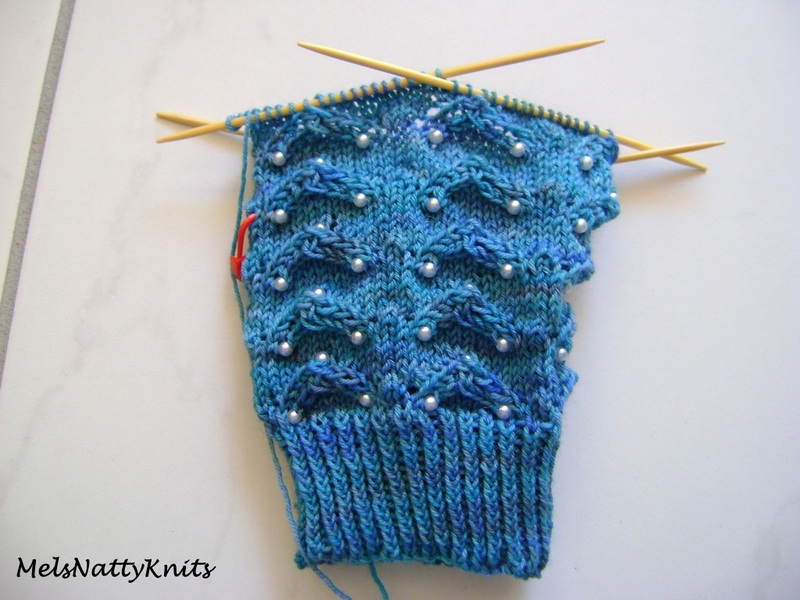 If you look at all the project notes in Ravelry you’ll find that some people cast on 6 or 7 stitches as opposed to the 5 in the pattern. This will make your scarf grow wider faster and I have used the 5, 6 and 7 cast on at the beginning of each row to give all the my scarves a slightly different look. But they are all symmetrical. This pattern is perfect if you need to make a few gifts and don’t want to have to be looking at the pattern all the time. You will memorise it in minutes. 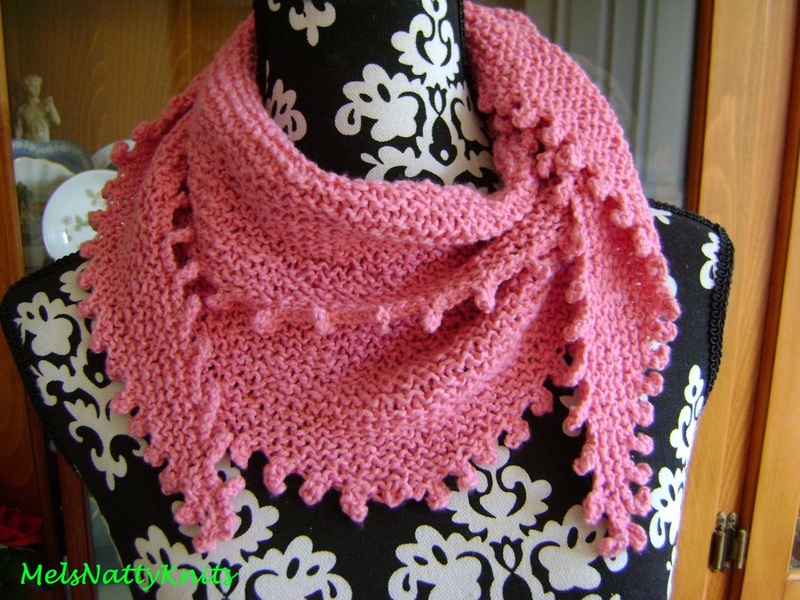 It’s perfect for knitting and chatting. 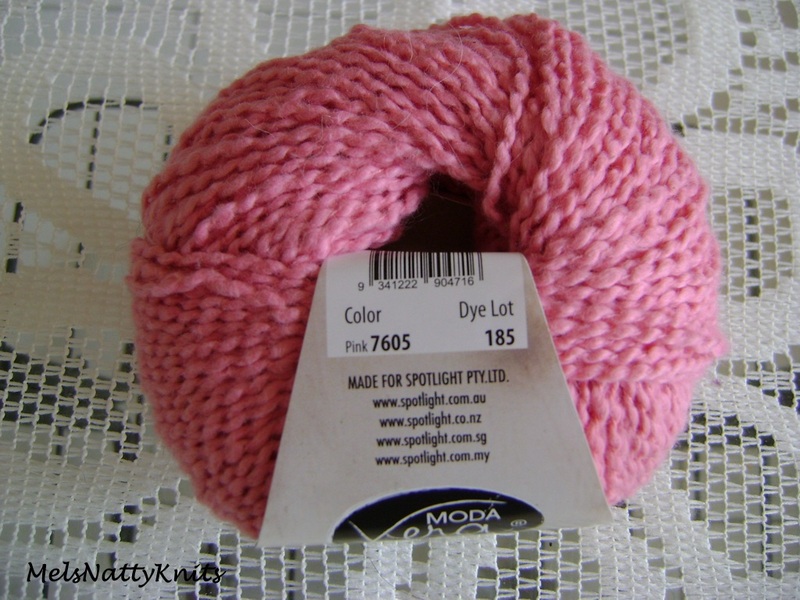 I have a small basket filled with yarn that I want to use for this pattern so I can simply finish one scarf and start the next. You won’t be disappointed! 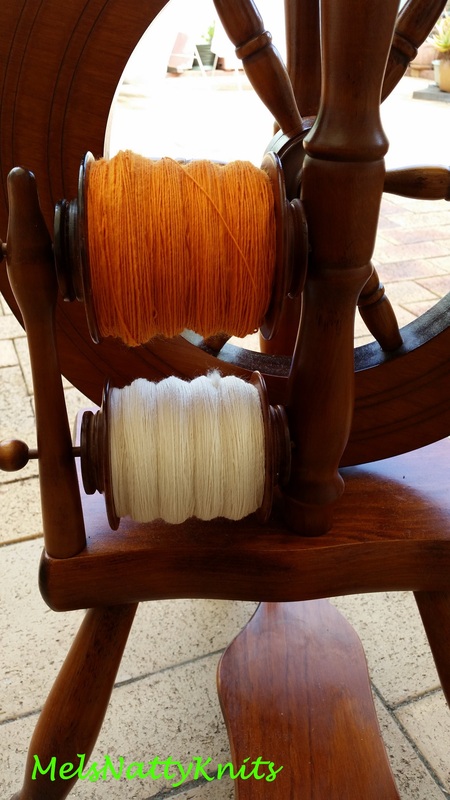 I have finally finished spinning 250g of some lovely tangerine merino and plied it with some undyed merino. 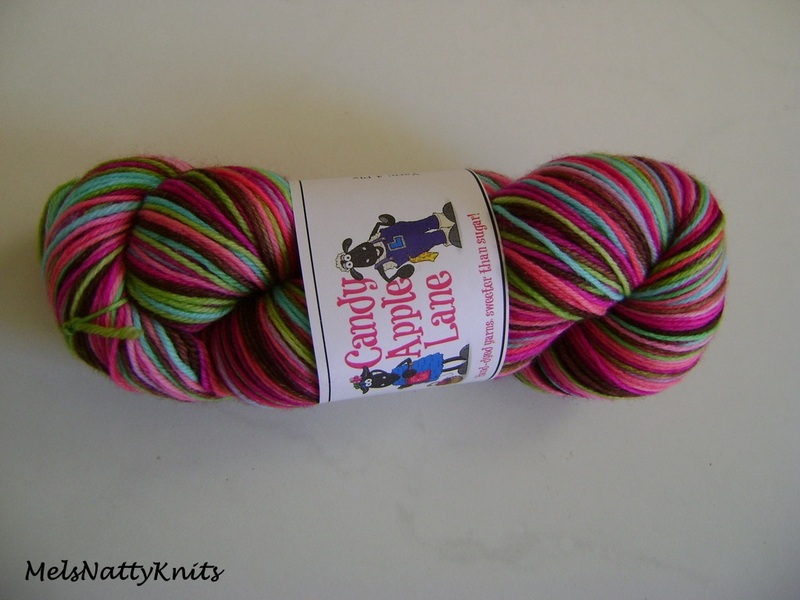 I was hoping for a lovely candy cane effect once plied and it’s exactly what I got! 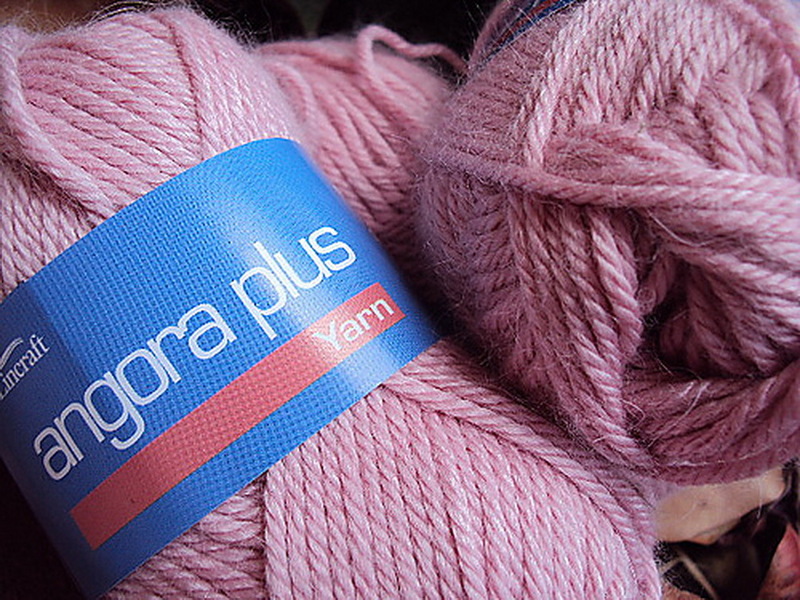 In total I have 399g and 1,403 yards of wool to make something really lovely. I was thinking of a poncho so I need to find the right pattern. 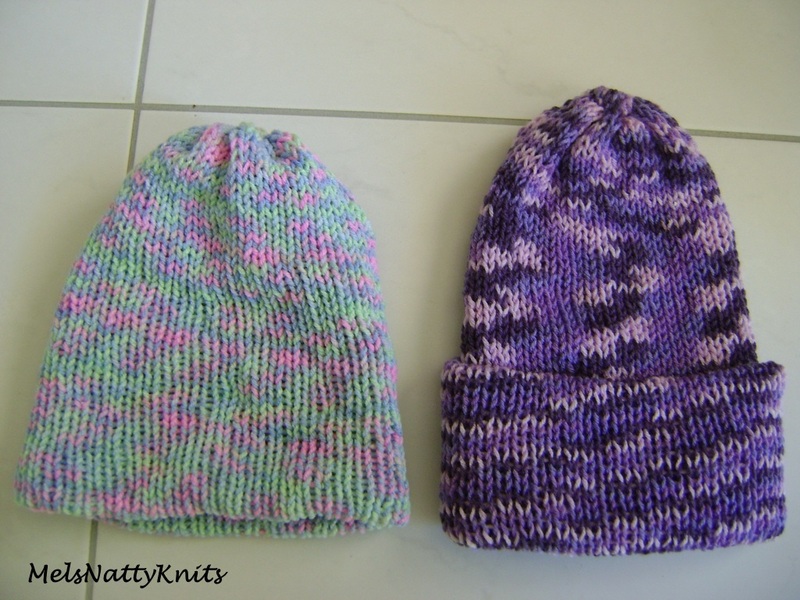 I’ve also been busy on my Addi Express Kingsize knitting machine making more beanies. 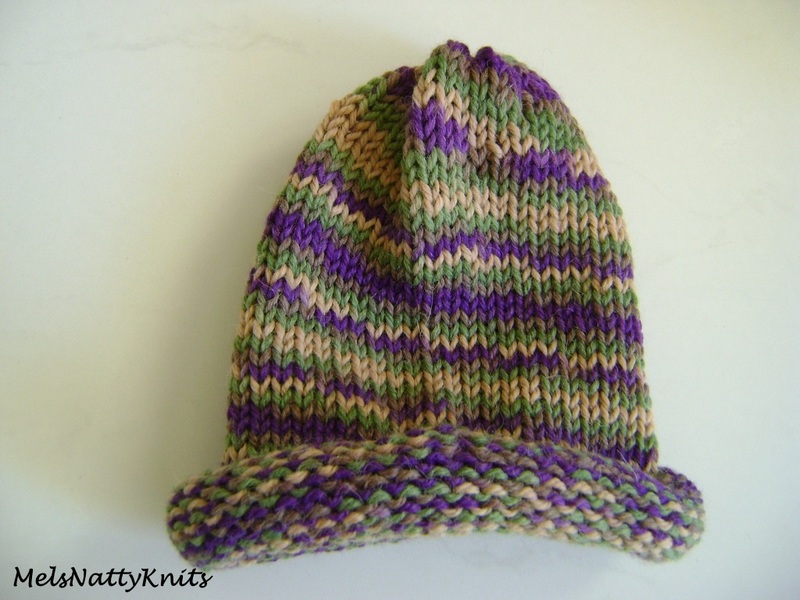 This one is made using one ball of Lincraft Ecuador which is a 40% acrylic / 40% wool / 20% alpaca yarn. I really love this colour combination. These two are for a friend and her daughter. Just made with a cheap acrylic but they’ll be easy to wash. I experimented making this scarf using two balls of Lincraft Surroundings which is a 100% acrylic. You could easily add pompoms if you so desire. 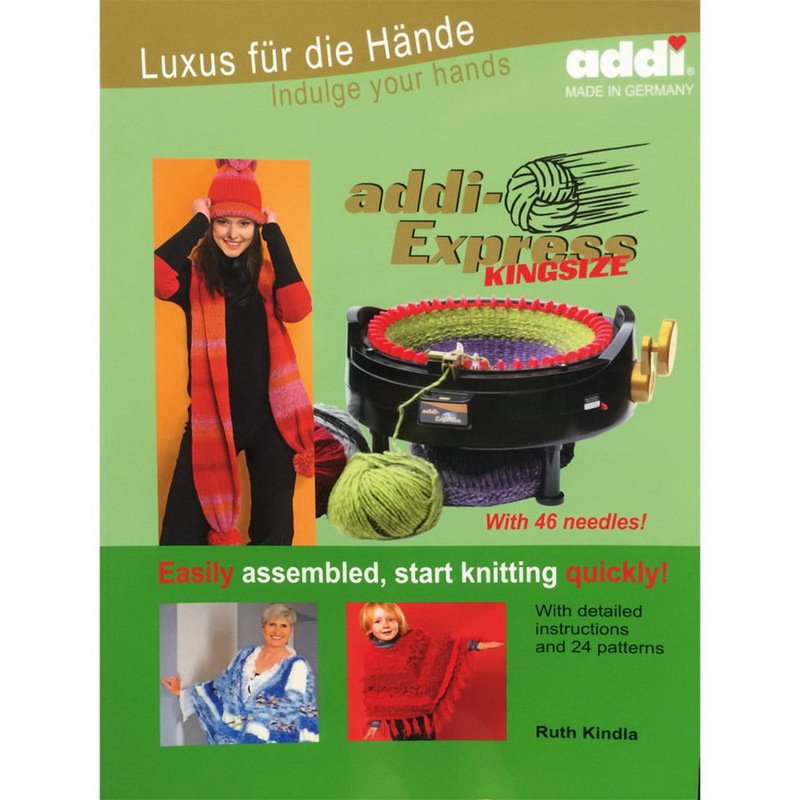 I found this book on Ebay especially for the Kingsize machine so I bought it and will try out some of these patterns. 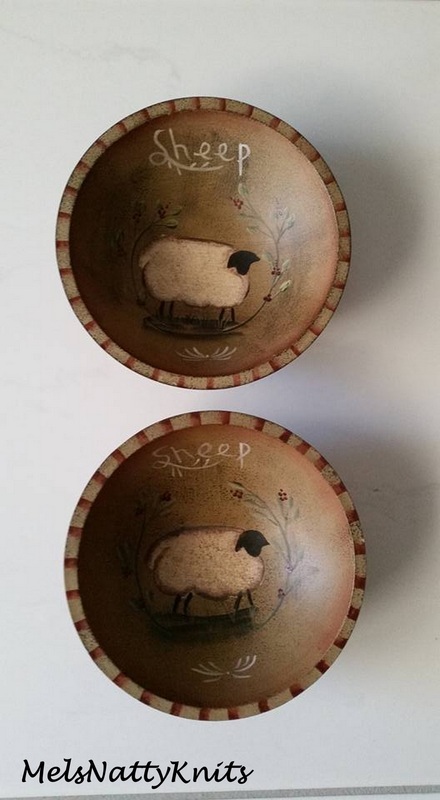 On Saturday at Knit and Knatter I picked up these two rather cute little bowls with sheep on them. We meet at Hoya Garden Plaza which has a huge gift shop attached to it. You could spend hours looking around and everything is so different. 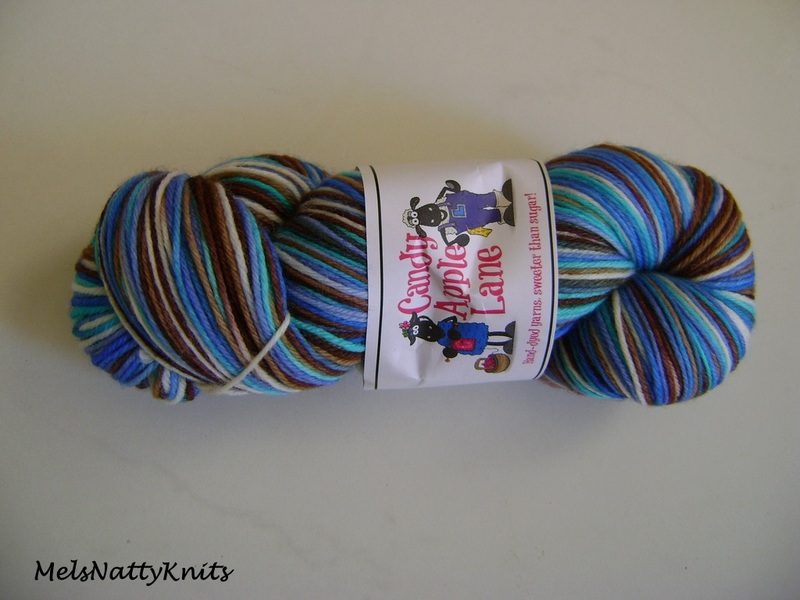 Have a look at this absolutely stunning yarn I’ve just received. 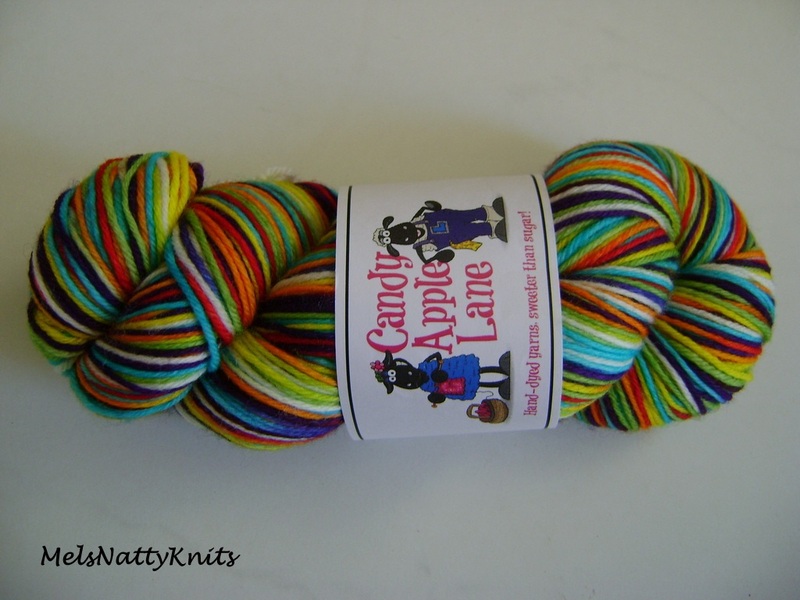 It’s from Candy Apple Lane and I saw it on Facebook and was just captivated. Isn’t it stunning? 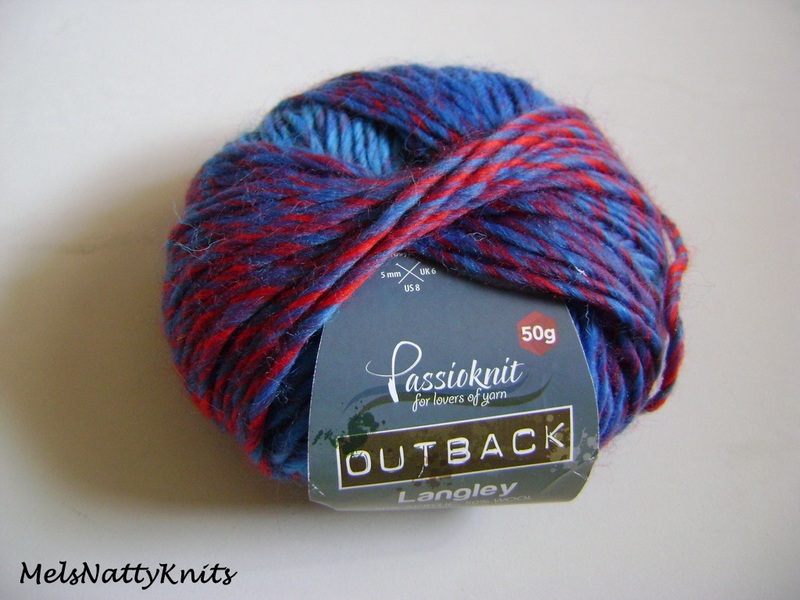 They’re known as the home of bright yarns and you’d have to agree with that statement! Earlier this year when I sold my car and bought a new one, I kept the car seat covers. 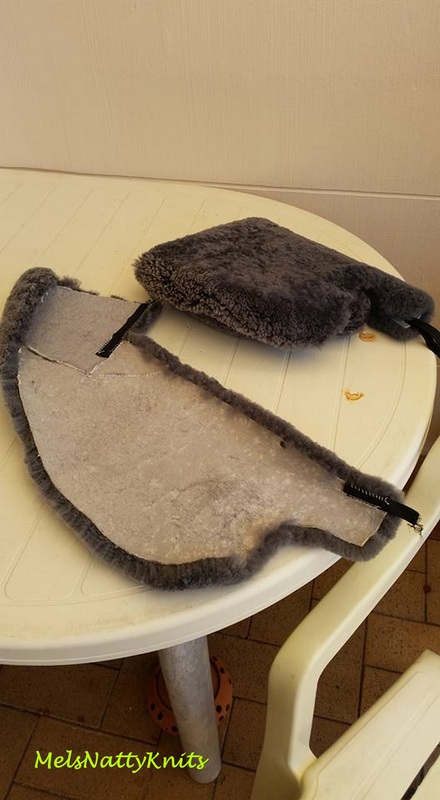 Even though they were nearly 17 years old they were genuine sheepskin so I thought I should be able to find a use for for them. Well that time has come and a couple of weeks ago I took them out of the plastic bags and started adapting them. 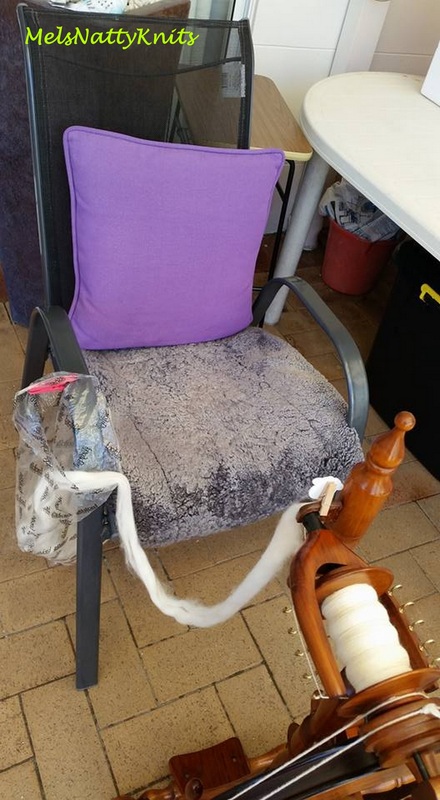 I now have a new chair pad on my outdoor spinning chair. 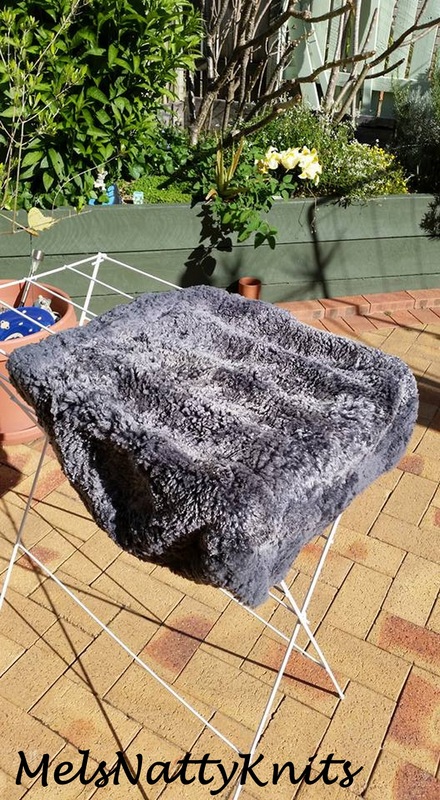 I washed another part and put it in the sun to dry and I’ll use this as a chair pad for my picnic chair. I’ll use this scrap piece for flick carding: the fluffy side on my lap and the skin side to flick card on. 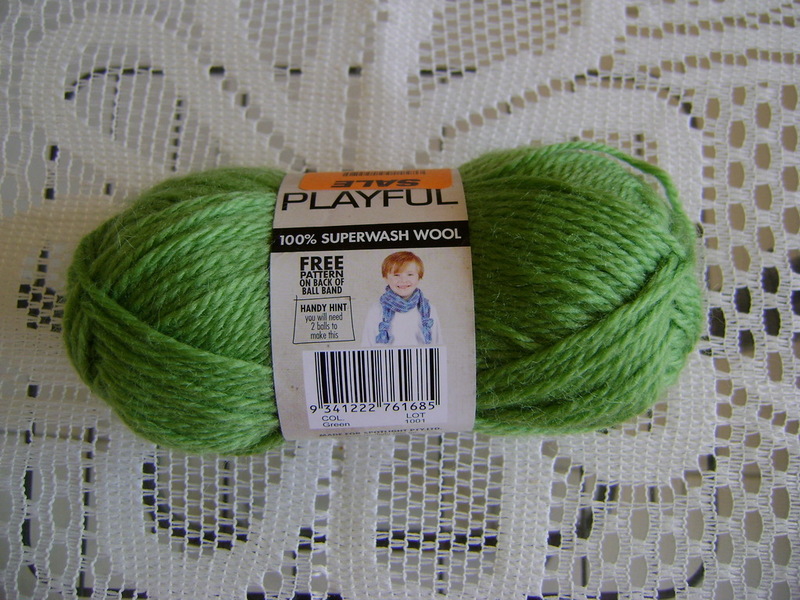 Plus I have enough left over so when I eventually get a little dog she’ll have something to snuggle up on. That’s what I call recycling at its best!! 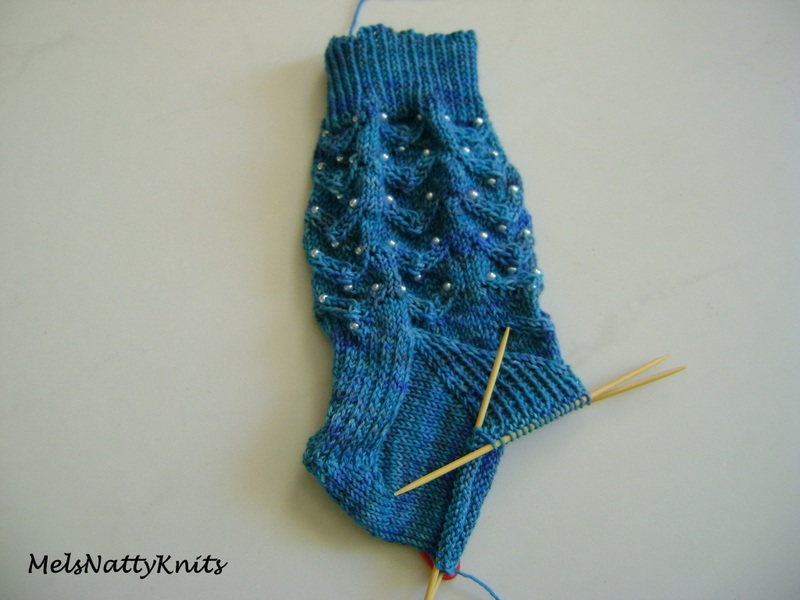 Last week I signed up as a test knitter for a gorgeous pair of socks called Promovendus. The pattern writer lives in The Netherlands. I must say I am loving these socks. It’s the first time I’ve used beads in socks. Here’s a sneak peek. That’s all my bits and pieces for the time being 🙂 I hope you have a wonderful week. Don’t ask me why I’ve just knitted two baby cardigans. I have absolutely no prospect of grandchildren in the foreseeable future and we’re just coming into summer here in Australia. 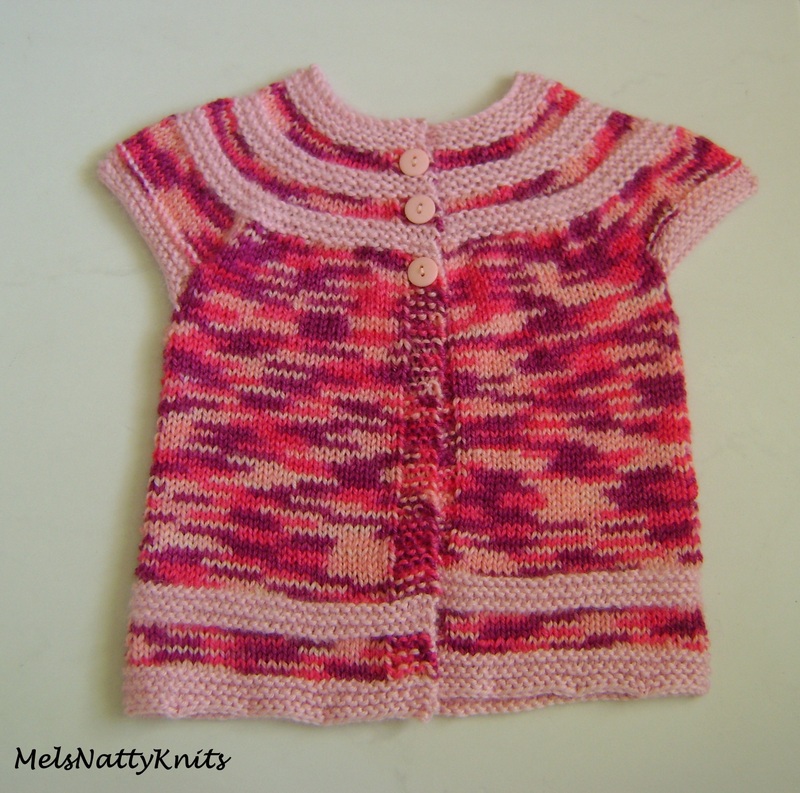 Maybe it has something to do with the fact that I was looking for a quick knit, or because one of my friends has been making these cardigans for her granddaughters and I’m envious 🙂 Or maybe it’s because I had some single balls of wool that I wanted to use up. Whatever the reason, I really love this pattern as I’ve made these cardigans previously (and probably for the same reasons above 🙂 ). 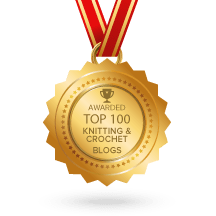 If you look on Ravelry, the In Threes Baby Cardigan has been made over 5,600 times which means it must have something going for it and I think it’s because it’s knitted in one piece from the neck down. 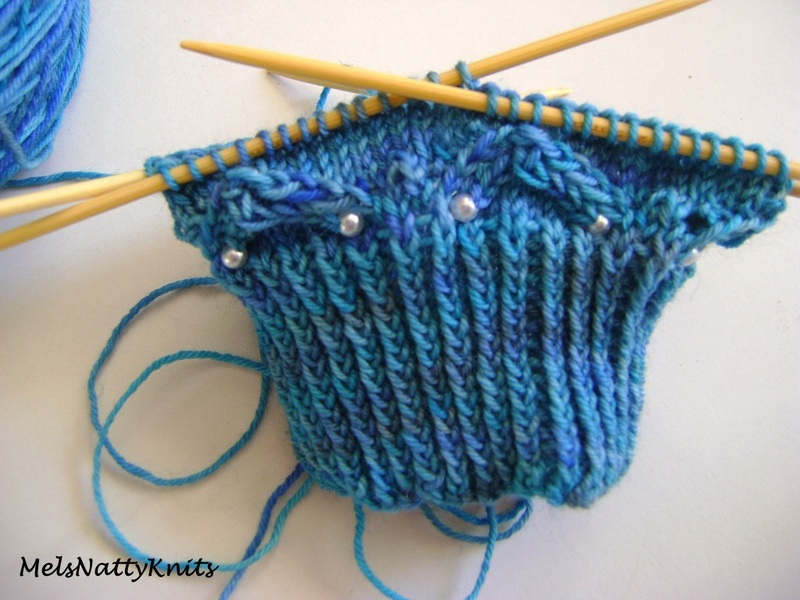 That’s my kind of knitting – no seams!! 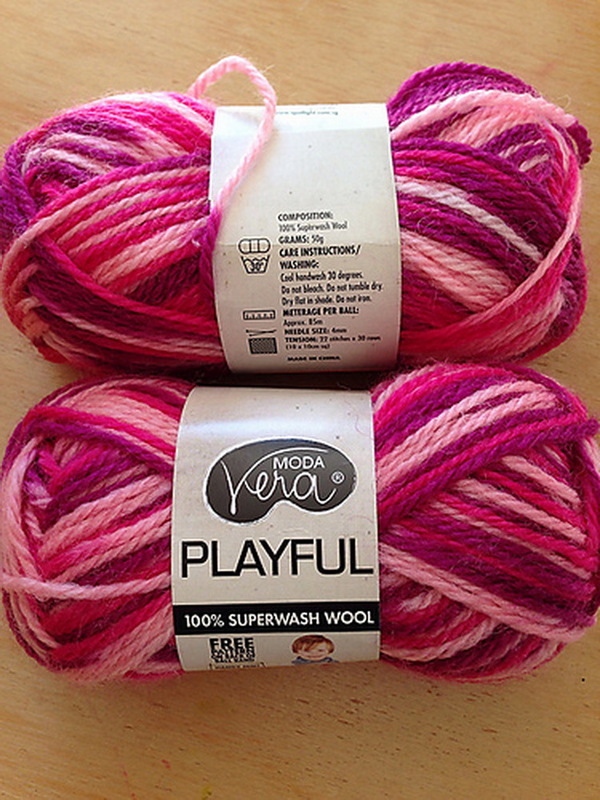 I used about 1.75 balls of Moda Vera Playful in this lovely variegated pink and about half a ball of Lincraft Angora Plus in the solid pale pink colour. 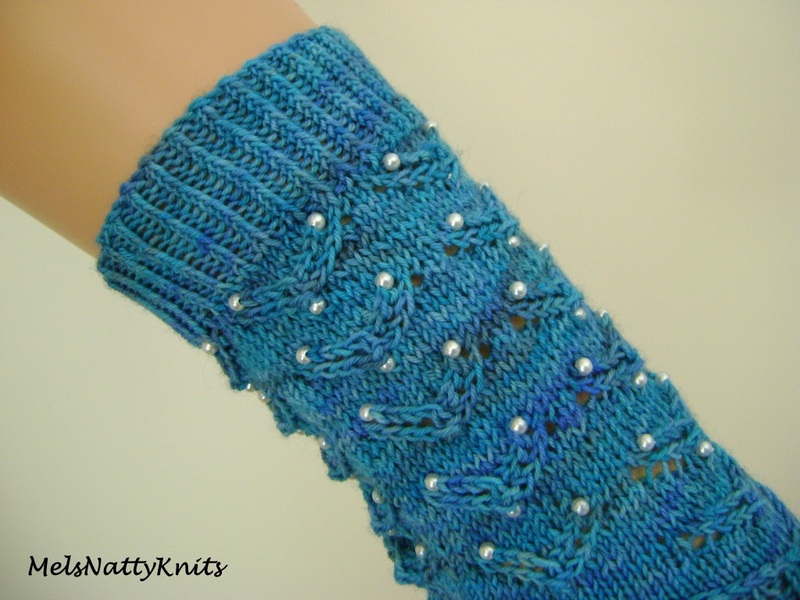 I was experimenting with using different yarns and I quite like the effect. 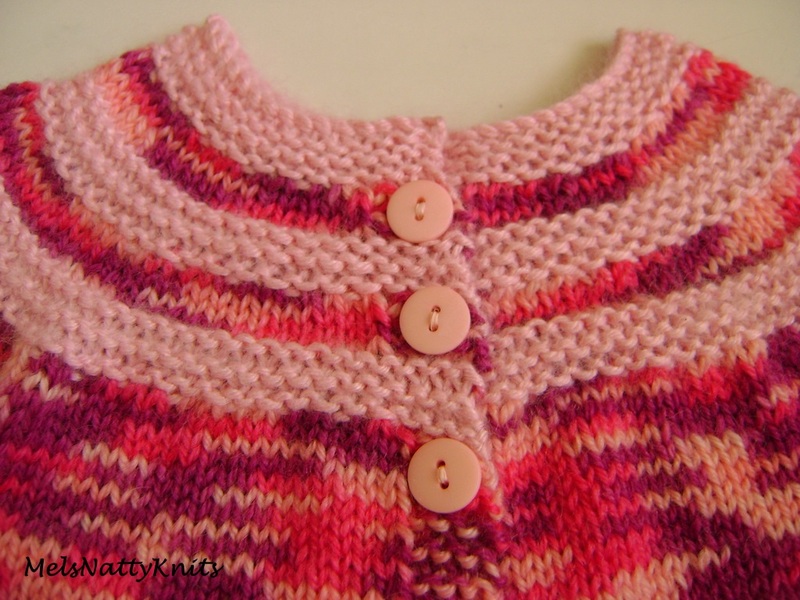 I think this little cardi would fit a 3-6 month baby girl. 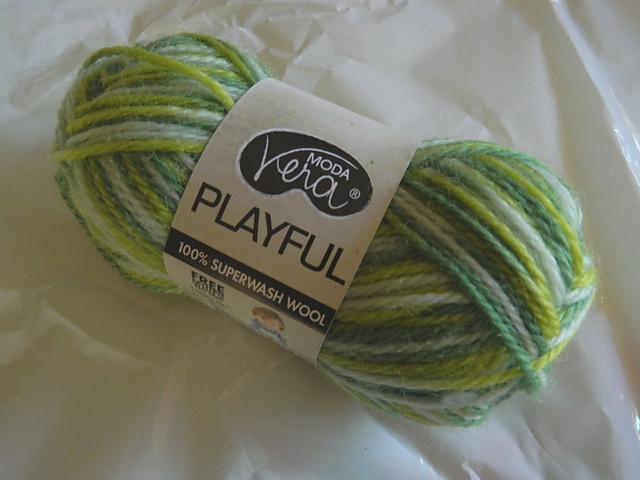 I only had one ball each of the variegated and solid green Moda Vera Playful wool so I varied the bottom of the cardi a bit. 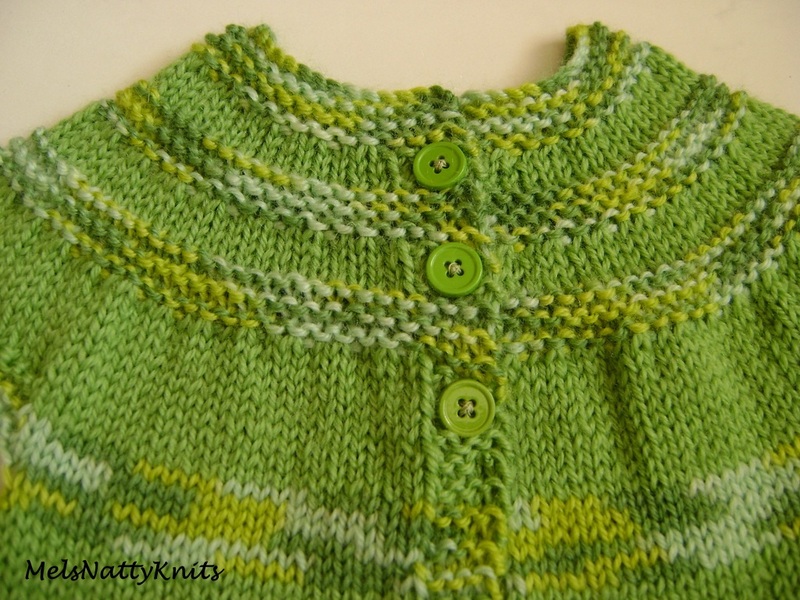 So if you’re busily knitting garments for a baby girl or even a little toddler, I can highly recommend this pattern. It’s quick and easy too. 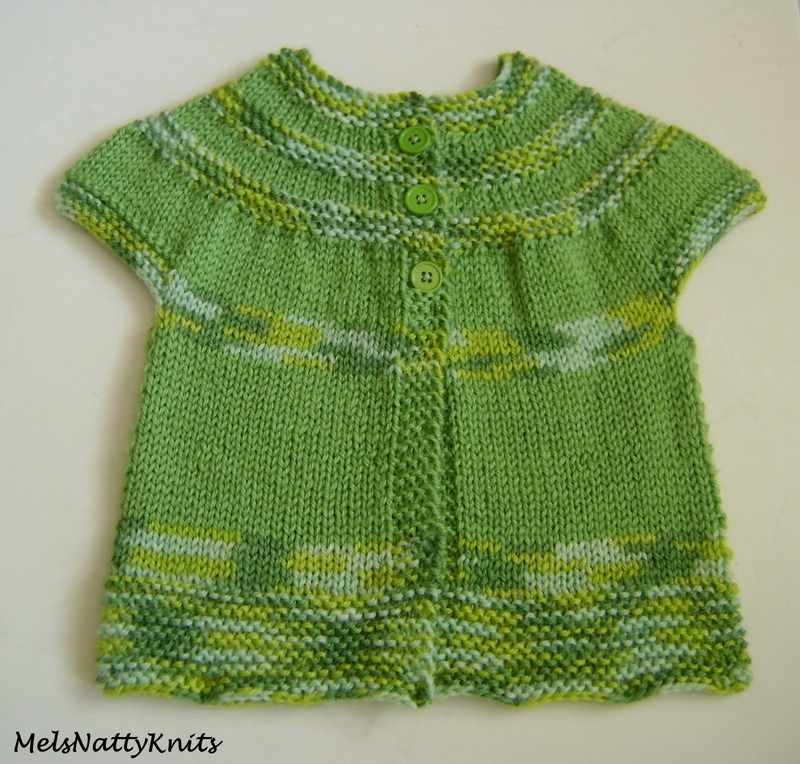 I think my green cardi will fit a 0-3 months old baby girl.